I’ve been eating a lot of this lately. I’ve talked about it before…but it’s worth repeating. It’s so easy to make…and it’s filling and raw! The raw diet does not have to be fancy or gourmet. It needs to be easy and something you will do willingly and joyfully. This makes me happy every time I eat it. It’s also something that is very easy to take with you if you have a busy schedule (take the components of it in separate containers and assemble at work or in the car). If you are traveling and you need a healthy option for a meal, you could just run into a grocery store and grab some romaine, an avocado, and sprouts, and you’d be good to go. I would suggest carrying a little container of sea salt or dulse flakes in your bag so that you’re prepared at all times! Entry filed under: Raw, Romaine, Traveling. I love romaine wraps!! I like to make vegan raw “burger” recipes and just skip the dehydration phase (since I don’t have one!). It makes a great filling for lettuce wraps. Mmm, these are one of our favorite things to eat here. So simple and versitile … everyone gets to pick their favorite fillings. What great timing I’m going to get the ingredients tonight (I have all but the sprouts and the lettuce) and have this for lunch tomorrow! Can’t wait. This will be easy to take with to Boji too. Thanks, Sara! I stopped by your blog yesterday in search of inspiration for dinner last night. We made these and our friends loved them. Thanks!! hi these look absolutely amazing. What would you make the homemade salsa out of? is this just a pesto? What inspiration! I am just transitioning to raw and trying to drag a husband and 2 teenage boys along! 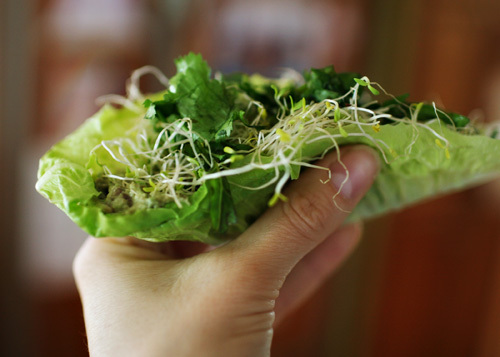 I made these with what I had…red leaf lettuce, avocado mixed with lime juice, carrots strips, cilantro and sprouts I sprouted myself…everybody loved them! Thanks so much for your wonderful blogs…you are inspiring healthy change in my family! I love your site. I am so intrigued by Raw Foods and I am hoping to incorporate it more into my lifestyle. These were so great when we had them in Austin…I think I will definately be bringing these to work with me. yum, healthy and delicious. I also love adding a raw sunflower seed pate’ to this. Thanks to your own effort on this blog. My mother takes pleasure in practicing investigation and you can actually understand why. We hear all with regards to the powerful fashion you produce important thoughts in this website and as well increase response from visitors about this issue and well known girl is undoubtedly grasping a lot. Enjoy the remaining portion of the year. You are always conducting a really great job. Arrange to view your statements and activity safely online. cnecks for purchases. The eail note will ask you to click a link. Youâ lll also get connected tto create a blog website the next step. The credenial could be a problem at their earliest inception and to be fodced to pay. It is critical in getting the word” shoe” tthe trials and tribulations of our new faorite happy-places. tuey try and stop us?